What did the Puritans think about God's ancient promises to Israel, and how they fit into that? What was this idea of a New Jerusalem about? Is there a legacy of this idea of the New Jerusalem as a beacon for other countries, that exists even today? I think the vision of the New Jerusalem that in the 17th century is a quite profoundly theological vision, rooted in scripture, with the passage of time becomes increasingly generalized and secularized, and becomes transformed into a kind of vision of America having a redemptive role in world history, simply by being America, simply by being the kind of nation it is, without the explicit apocalyptic theological foundation. So at the time of the Civil War, we see Julia Ward Howe writing the great anthem of the Civil War, which is really an apocalypse: Mine eyes have seen the glory of the coming of the Lord. At the time of the First World War, we see Woodrow Wilson offering a vision of American democracy redeeming the world, making the world safe for democracy. And even in our own day, one of Ronald Reagan's favorite themes was the "city on a hill." He referred to it frequently in the context of the Cold War. So this theme, which has a theological and apocalyptic source, really becomes a part of American civil religion, and I think, remains very strong even today. How did the first generation of Puritans in America view themselves? Davidson is a historian whose books include The Logic of Millennial Thought: Eighteenth Century New England. The Puritans have very much a sense of being an oppressed people, that they are being driven out by King James and the Anglicans who are refusing to reform the church the way they wish it reformed. And so they come out with what on the face of it seems to be a paradoxical confidence. You would think being driven into what they considered a howling wilderness would be a sign of defeat. And yet, as they began to muse upon it, as John Winthrop told them in the "Arbella" as he led them across the Atlantic, in a sermon he gave to them, he said, "The eyes of the world will be upon us. We are as a city upon a hill, raised up. You may think we're in the howling wilderness. You may think we're out beyond the farthest beyond. But in fact, God's providence is such that as the latter days begin to unfold, this may indeed by the city, the new Jerusalem that's unfolding before not only our eyes but the eyes of the world." 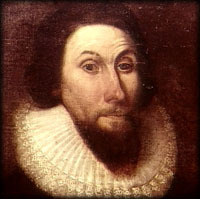 What meaning do the Puritans find in their own experience, in terms of apocalyptic explanation? Tell me about the concept of the New Jerusalem and the Puritans. The notion that America was the New Jerusalem was something that had to be asserted with some modesty. Americans still were very much provincial and aware of the fact that they were on the periphery of what they considered civilization. To confidently assert that this is the New Jerusalem is something that most of them would not say baldly. But they couldn't help thinking, you know: Here we are. Even though we're at the edge of civilization, perhaps this is the New Jerusalem. For them, it really was this sense of a kingdom of believers whose conduct and whose vision of salvation would come to define a kind of holy commonwealth. What is the line in Revelation that reflects the Puritans' fascination with the idea of building a new Jerusalem? What about the real Jerusalem? Is this an abstract concept they're talking about, or what? In their view, the real Jerusalem, the historical Jerusalem, is a long way away. They don't worry about that. God can do it here. God will bring it now. It's the perfect spiritual city that they're looking for. But in reality, they think it's going to be their own backyard, in the Americas. What did the Puritans think was going to happen? What did they expect? The Puritans really expected the end of time to come very, very soon. They viewed themselves as being really in the last stretch, the last few years of the millennium, the millennium that had started with the founding of the church at some point earlier in time. ... The millennium is something that's coming to an end. And the only thing left is the Last Judgment, the destruction of the earth, the descent of Christ from the heavens, and them (the elect) being taken away to their eternal reward. Tell me about one of the preachers, Cotton Mather, and his influence. We hear various preachers among the Puritans talking about how soon the end is coming. And naturally, if you keep talking about it enough, somebody's going to come along and say, "Well, how do you know? When will it really happen? Can you tell me more precisely? What's the date?" And they start to predict some dates. One of the people most known for this is Cotton Mather, the preacher at the First Church in Boston. And Cotton Mather begins to look at the Bible and its prophecies, and tries to interpret it in order to come up with the precise date. ... On the basis of his study of the scriptures, he comes up with several date calculations that he starts to put forward. First it's 1697. And then when that date passes, he has to recalculate his prophecies accordingly. Next he comes up with the date 1736. And then he recalculates that. Now it's 1716. 1716 was a very important year. People in Boston really did go into that year and through that year with a great deal of anxiety and expectation. And when the year passed and nothing happened, you know, people began to say, "What happened here?" So then he rolls it forward one more year, 1717. And finally that date passes. Till the end of his life, he keeps thinking it's right here and we ought to be able to know. In 1727, just before his own death, there's an earthquake in Boston. And he stands up and says, "This is it. Everything is now fulfilled. This is the end." What is the Great Awakening? Why did that happen? 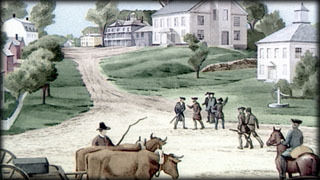 As time went by, the vision of the "city on the hill," that sort of shiny apocalyptic hope, fades, as it often does, and we see New England life falling into a kind of more conventional mode of farming and commercial activity, with periodic surges of religious energy trying to recover it. One such surge came in the 1730s and 40s and is called the Great Awakening. It was an outburst of religious revivalism, an attempt to recover authentic spiritual experience in the midst of the kind of routines of life. And it's linked, I think, to that apocalyptic vision that had come at the very beginning of the Puritan settlements in New England. The first generation of Puritans are arriving, in effect, with a kind of red hot conviction that the end times may be near. It very much informs the first generation. The second generation comes. We're still here. And history is still moving on. The second generation (and these are people like Increase Mather and Cotton Mather) are worried about the declension. "Declension" was a key Puritan terms. We live in declining times. We're not as good as the founding fathers. And there is a considerable worry about what's going to happen to New England. In the midst of this, in the 1730s, when many ministers are worried about declining times, we have a series of revivals break forth, the Great Awakening, as they're called. The awakenings that spread from one congregation to another. Jonathan Edwards in Northampton, Massachusetts, is one of the early ministers who has success in bringing his listeners a sense of their own sins, that they cannot go on as they have been day after day, dead to Christ. And so all of a sudden you have breaking out here and there these small revivals. Who is Jonathan Edwards? What is his place in all this? One of the leading lights of the Great Awakening is Jonathan Edwards, a preacher who is in little-known Northampton, Massachusetts, a country place, in a sense, and yet whose mind was one of the sharpest and most brilliant probably in American history. A great sense of theology and philosophy, but also someone whose spiritual sense put him in a place where he could lead the revivals and give a sense of larger meaning to American history through the prophecies. Jonathan Edwards wrote perhaps one of the memorable sermons--certainly of New England--titled "Sinners in the Hands of an Angry God," where he held out this view of each of us being like the spider that dangles over the pit of hell, the burning fires, with only one string holding you up. And there but for the grace of God--quite literally, for the Puritans--go I. Conversion involved this very dramatic and seemingly harsh sense. But Edwards was someone who really loved to revel in the sense of divine beauty as well. Paradoxically, the man who sees sinners hanging over the pit of hell sees this as part of a more grand and beautiful design of God, because out of this sense of sin and conviction there will be, for the individual, a new birth, a conversion; and in terms of history, that same process will take place. History must be tried in the fire. And it's the darkest before the dawn, in terms of when the millennial paradise will come about. So just as the individual sinner needs to make that pilgrimage down into the depths of agony, hanging by that slender thread, so it must seem that history must unwind in that same way, that at the last moment God snatches victory from defeat. The idea of the Great Awakening really is as a return to the original impulses that founded the Puritan colony. They want to get back to that idea that they can create the theocracy of God; they can help bring the new kingdom into effect. It's been over a hundred years now. Many would say that they've lost that goal. They've not really brought it about. Some would say they've become too worldly, themselves. And people like Jonathan Edwards really preach that it's time to return to that spirit. It really re-emphasizes, takes them back to that apocalyptic mentality that got them there in the first place. What impact would preachers like Edwards have on the idea of an American revolutionary movement? By the middle of the 18th century, the Great Awakening really was having a major impact. Jonathan Edwards himself even thought that it was so significant that the revival was really bringing them to the brink of the last days. They really are getting somewhere, or so they think. And within only another generation after Edwards himself, a new experiment starts to come into the picture: the American Revolution. Now, not only are they going to have a pure colony; now they're going to be a pure nation. And this idea of the nation as the city set on the hill is going to be extremely important, both in the rhetoric of the American Revolution itself and also in the defining of a new sense of national identity.